August means back to school, an end to summer, and a new Dog of the Month! This month we’re highlighting Riley Rae! 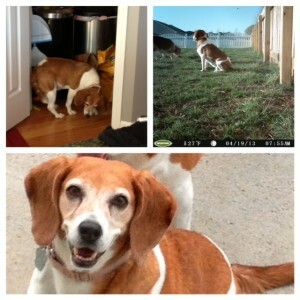 Riley Rae is an approximately 6 year old beagle, who was rescued from a puppy mill. She was very shy when she first entered foster care. She is now much more comfortable around people, but is still a little hesitant when she first meets you. So, fill out an Adoption Application for Riley Rae today. Do you want to find out more about Riley Rae? Then check out her full profile. * Actual results may vary. BBRH does not guarantee a reduction in the population of bunnies, squirrels birds, chipmunks voles, moles, gophers, or any other small animals. Beagle effectiveness varies from dog to dog. In non-scientific studies beagles caught small animals, in the backyard of the tester, 0.5% of the time. This entry was posted in Dog of the Month on August 8, 2013 by Richard.